Update: I made these last year and I loved the idea but I only made it through a few months before we got busy and I got behind. My kids still bring it up how much fun they had and how they loved it so I am going to give it a go again this year. I think instead of stay up late I might do some of the activities during quiet time because nights get so busy I had a hard time keeping up with that part. Here’s to another year at trying to be a better mom!!! Wish me luck……. 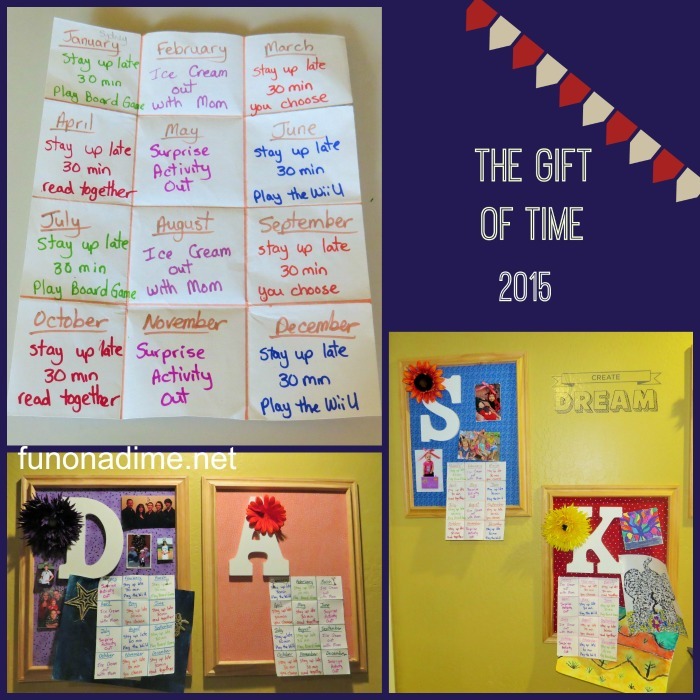 My super smart friend Alisa gives her kids “The Gift of Time” each Christmas. 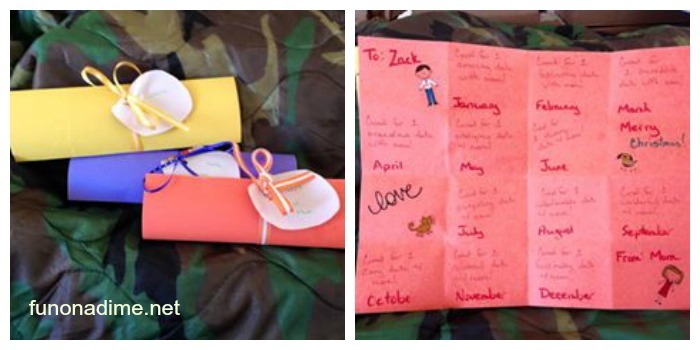 She takes them each on an individual date each month for the year. She wraps it up and it looks like this. Now obviously I missed Christmas but I thought I could do this as a New Year presents because I thought it would be the perfect thing to do for my kids. Now with 7 kids there is no way I could take 7 kids out individually each month. Not only having the time to do this but it would definitely be a budget buster so I have been thinking long and hard how to make this work and this is what I have come up with. 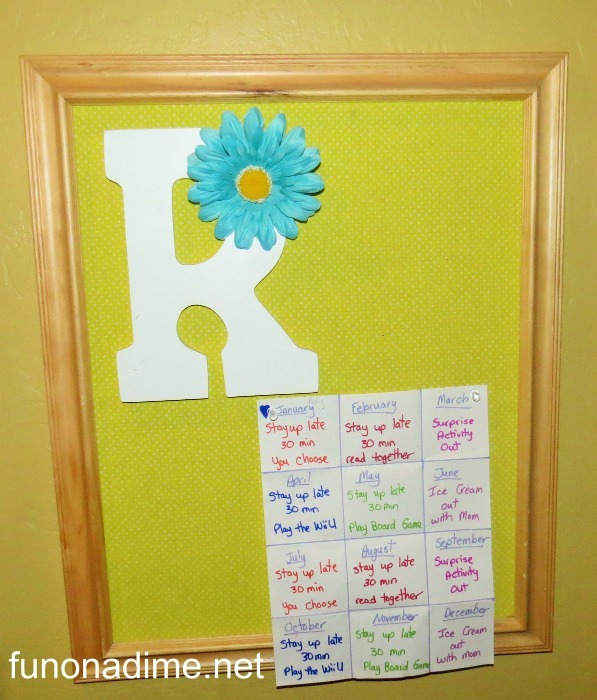 I came up with 6 individual activities that can be done twice a year with each kid that gives them the one on one time the crave but makes it more manageable for me. 2. Stay up late 30 minutes and play the Wii U. Now for those of you that read this and think staying up 30 minutes late isn’t much time or a big deal I have to say this is a huge sacrifice for me. I am done being a mom at 8 o’clock when bed time rolls around. I love my kids and spend all day long every day with them but there comes a time at night when I just need some peace and quiet and 8 o’clock is my magic number. So me giving them that extra time to them that is normally mine is a big deal and they get that. It is part of my goals for the year to make my kids feel important and practice more patience this will be a gigantic test in patience each month as we do these things but I know it will be worth it in the end!! 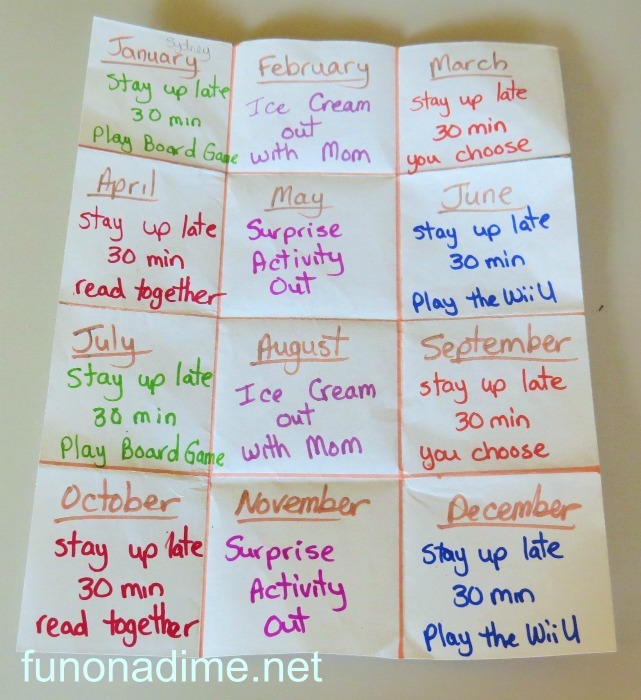 I set it up so that each kid does a different activity each month. I have 5 kids participating so there is one activity each month I don’t do. Each kid picked a piece of paper at random so I wasn’t assigning who got what the first month. We are hanging them on their bulletin boards in our hallway so I will see them numerous times a day so no forgetting!! Not that I think the kids would ever let me forget. They are all anxiously awaiting their turns to start! What do you do to show your kids how special they are to you and give them one on one time? I would love more suggestions! !